In today's volatile economy, it's always a good idea to diversify your holdings. So while it might seem to be an unusual choice, perhaps you might consider buying magic items . . . such as those found in GURPS Classic: Magic Items 2. 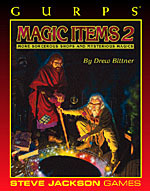 Newly released to e23, this supplement includes over 450 magic items, including protective garb, weapons, holy (and necromatic) gear, magic for adventurers (or homebodies), and much more. Sure, these items may not go up in value, but they're still likely to provide a more tangible return in imaginary enjoyment than all those dot-com stock certificates atop your "scrap notepaper" pile. Besides, none of those stock certificates have goodies such as the Treespeech Talisman, the Demon of One Thousand Keys, or the Billy Goat Golem. No, you can only find such fare in this fine supplement. So call up your financial advisor and tell him you want to get in on the amazing world of magic-item research and development. When he hangs up on you, head over to e23 and pick up a copy of GURPS Classic: Magic Items 2. Your stock portfolio won't thank you, but your arcane folio will!